"A rich custard-like filling. The combined flavor of apples and cream cheese is mouthwatering. Strawberry jelly may be used in place of apricot preserves." Place sliced apples in a large bowl and toss with sugar and lemon juice. Melt butter or margarine in a large skillet over medium heat. Add apples to skillet and saute until tender. Allow to cool. In a medium mixing bowl, beat cream cheese until fluffy. Gradually beat in 1 cup milk, pudding mix, and lemon rind. Add remaining 1/2 cup milk, and beat until smooth. Spread mixture into pastry shell. 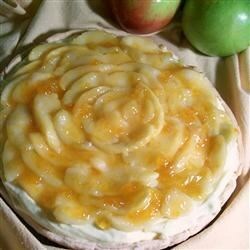 Arrange apples over cream cheese layer. In a small saucepan, heat preserves until runny. Using a pastry brush, lightly coat apples. Refrigerate pie for at least 1 hour before serving. I went to visit my moms house for thr first time with my soon to be husband. I had to bring something special as well as good can get! This was perfect!! Everyone had seconds!!!! The pie was amazing! I followed the directions almost exactly except that I used ready-made graham cracker pie shell. Thanks for the recipe, Karen! I will definitely bake it again.